Great 3 bedroom / 2 bathroom home located in East Sparks near Reed High School. Home features 1230 sf with beautiful, glowing laminate wood floors and clean, neutral paint. Entire home is bright and open with plenty of natural light. The master bedroom features a great walk-in closet and a built in bookcase is located in one of the additional bedrooms. The kitchen features a gas stove top and stainless steel appliances and opens directly into the family room. The open floor plan is great for families and entertaining guests. A sliding door from the kitchen draws you out to the large backyard. 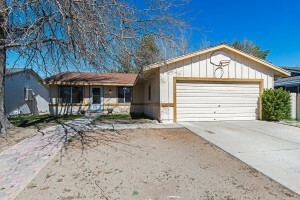 The property has great mature landscaping with large shady trees and automatic sprinklers. Schedule a tour today…will move quickly!